Brigthen your day with these rainbow twist marshmallows! Enjoy them alone or in a chocolate fondue. 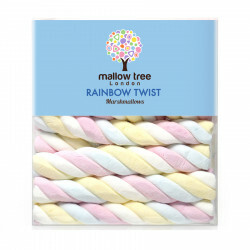 Brigthen your day and revive your childhood with these rainbow twist marshmallows! Enjoy them alone or in a chocolate fondue. A true delight! Ingredients: glucose-fructose syrup, water, sugar, gelatine (from pork), maïze starch, milk proteins, flavourings, colours (E100, E120, E133). Allergy advice: contains milk. manufactured and packaged in a facility that handles nuts and peanuts, Wheat and soy. Not suitable for someone allergic to nuts.